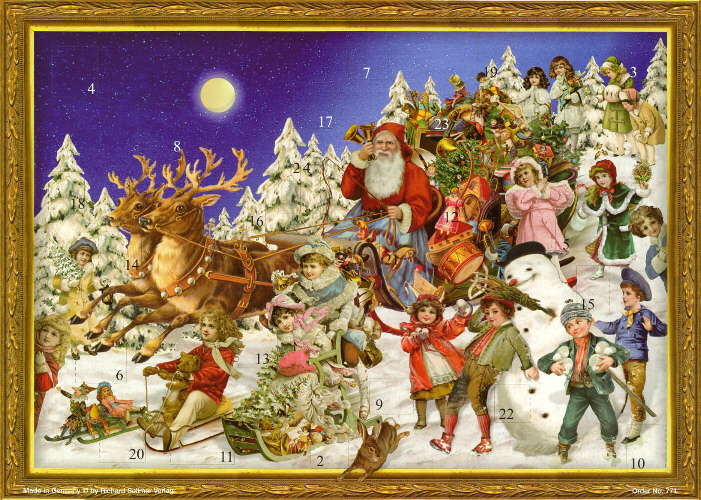 This Christmas carol is different from many of the others in that it blends both pagan and Christian ideas, symbols and sentiments. 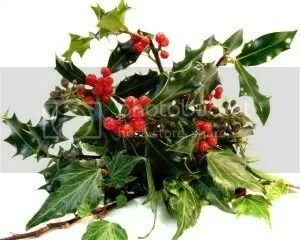 The typically pagan symbols of holly and ivy are primitive symbols of the male and female, whilst the image of the ‘The rising of the sun’ is clearly linked to paganism. 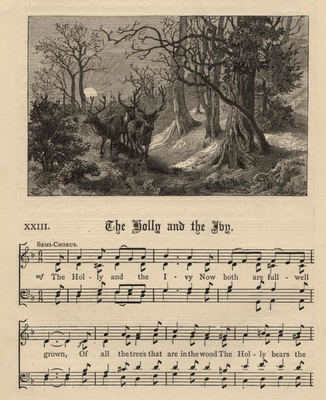 It is thought that the words of the carol were originally associated with an ancient fertility dance. I was lucky enough to win a fabulous set of Pampered Chef stainless steel cookware recently, for the photo competition on the Fish is the Dish website. My winning photo was for a hearty and yet elegant fish recipe called Baked Cod with Butter Beans and Vine Tomatoes, and the set of cookware in question is a fantastic three piece set that comprises a covered casserole, covered saucepan and a sauté pan which retail at £235. This amazing prize was offered on behalf of The Pampered Chef UK by the Fish is the Dish website, a helpful and informative site aimed at promoting British fish and seafood; they actively engage with food bloggers and their site is fun, innovative and as fresh as a piece of freshly caught cod! I particularly like their Fish’ n ‘Tips section which offers tips on how to buy, prepare, cook and serve fish and seafood ~ each section is accompanied with attractive photos, videos and of course a list of handy fishy tips. The recipes section is growing all the time and offers imaginative and tasty creations, of which I am proud to say, my recipe is one of them. The website also offers fish and seafood suppliers a chance to list their business’ on there, and as a Yorkshire lass, I was particularly delighted to see Whitby Seafoods listed, as well as Youngs, Scottish Shellfish, Delish Fish and the Saucy Fish company. The full list of suppliers can be found here: Seafood Suppliers. The website has a bright, modern feel to it and I love the fact that ordinary mums and food bloggers are able to participate and engage, which, lends a friendly and homely atmosphere to the site along with a good dose of common sense too! Nutritional information, fishing methods, seasonality and sustainability are all featured as important factors when choosing British fish and seafood and the handy Fish of the Month section is a great source for seasonal ideas. 600 Million mussels are produced in the UK every year. They are the ultimate fast food and great value for money. Mussels are usually purchased ‘live in the shell’. The most popular way to serve them in the UK is as ‘moules mariniere’ or ‘moules and frites. They are also available pre-cooked and processed in a range of sauces. With a big thanks once again to Fish is the Dish and The Pampered Chef UK for my prize, please do visit both their websites for fresh fish ideas and amazing cookware to cook them in! I will be back with more festive recipes tomorrow, see you then. Spoon the butter beans into an oven-proof dish and add the finely minced garlic, mixing well. 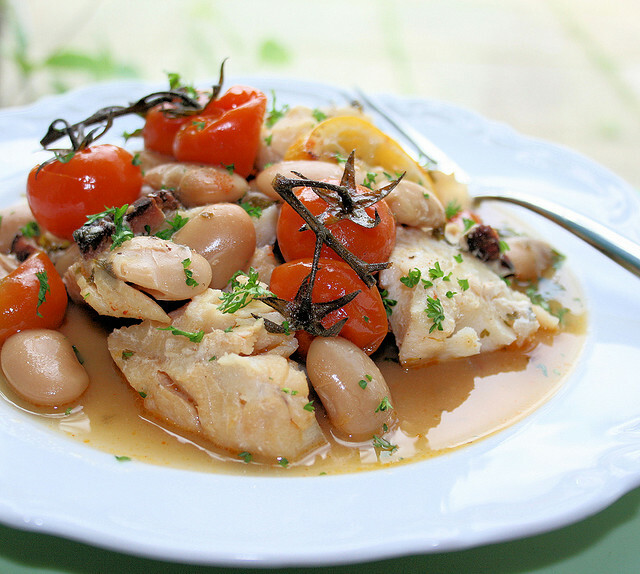 Wash, wipe and pat the cod fillets dry before placing on top of the butter beans in the oven-proof dish, then season well with salt and pepper. Drizzle the olive oil over the fish fillets. Pour over the white wine and arange the lemon slices on top of the fish fillets before. Cover the dish with some tinfoil, before baking in pre-heated oven for 20 minutes; after 20 minutes, take the fish out and arrange the cherry tomatoes on the vine in and around the fish fillets before baking for a further 5 to 10 minutes until the fish is cooked and breaks away in large flakes, and is still moist and the cherry tomatoes are soft. Serve immediately with a sprinkling of Pimenton (smoked paprika) and some freshly chopped parsley over the top; allow 3 to 4 cherry tomatoes per person and some cooked lemon slices. Serve with the cooking juices and some crusty bread, as well as a side salad. Congratulations on winning that beautiful set of Pampered Chef cookware. I have several of their pots and pans and love them. This looks like a wonderful recipe, Karen. This dish will be very welcome after next week's rich and heavy meals. Mussels aren't often available here. Our specialty is dungeness crab which will be in the markets this weekend in time for Christmas. Thanks Marie ~ I was chuffed to bits as you can imagine! Thanks Cathy ~ I am so impressed with the quality of the pans, they are excellent and I love the sauté pan in particular! Your dish looks pretty, I d love to try it out. crisp clear photos, very nice! Thanks Helene! I was thrilled to bits with my win and the recipe is also a favourite of ours too! Congrats Karen what a fabulous prize. 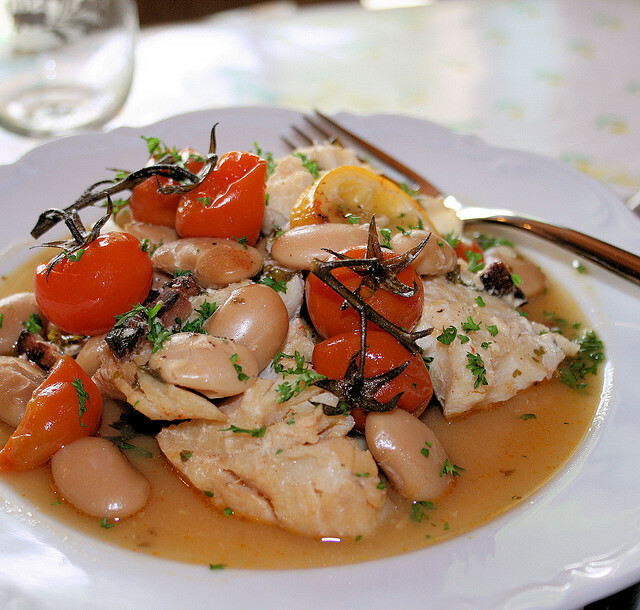 Great recipe-love both fish and butter beans. Will be trying this in the week. Ooo I love cod and butter beans–looks delicious, as always. Congrats on the cookware set. What a great prize! Well deserved win Karen. I could eat up that lovely fishy dishy anytime. Congratulations! This is a great recipe for a fabulous prize. Love all the flavours here. The picture looks so inviting! This cod dish sounds gorgeous – such a nice change from all the heavy Christmas food we're all eating at the moment!